There will be a full-time, dedicated lifestyle director who will plan ongoing community social events. 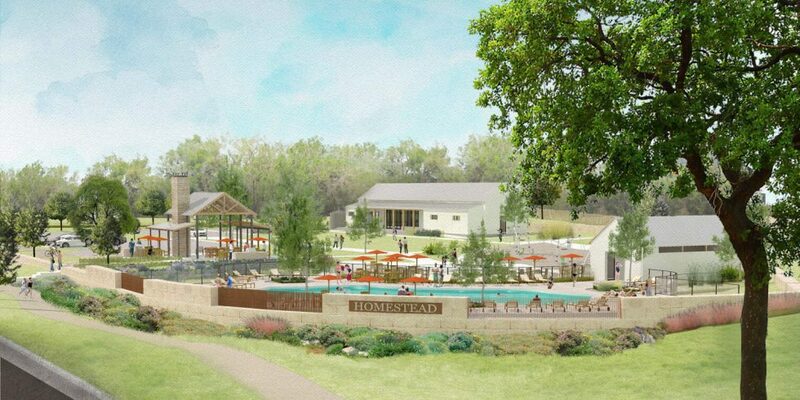 Additionally, Homestead will have direct access to a Schertz public park. Prices will begin in the $200s. The Schertz/Cibolo area has been the scene of much residential and commercial development over the last 15 years or so. “Homestead’s architectural style is centered on family, community and a respect for the land,” said Suzanne Maddalon, vice president of marketing for Freehold Communities, in a news release, “Homestead boasts one of the highest elevations in Guadalupe County, and with our builder teams now established, we plan to embrace Vital Communities principles with architectural cues from farms and homesteads of a much simpler time.” Infrastructure and model homes for Phase I are anticipated to be completed by late this summer. Over the past 30 years, Scott Felder Homes has become one of the largest producers of move-up homes in the San Antonio and Austin areas. Known for innovative designs, custom features, high-quality construction and energy-efficient homes, Scott Felder Homes is a and a 10-time Builder of the Year award winner. It was honored with the prestigious “Volume Builder of the Year” awards by the Texas Association of Builders, by the Greater San Antonio Builders Association, and by the Home Builders Association of Greater Austin. Pulte Homes is part of the PulteGroup, one of America’s largest homebuilding companies with operations in 50 markets throughout the country. A custom builder of homes with Life Tested smart-home features, its brand portfolio includes Centex, Pulte Homes, Del Webb, DiVosta Homes and John Wieland Homes and Neighborhoods. CastleRock Communities has more than 100 years of experience in homebuilding and community development, with expertise in single-family, town home, mid-rise and custom homes. Freehold Communities is currently developing 10,000 residential lots in Texas, Tennessee, North Carolina, Florida, and California.